There's a lot of repeat work with animals although no two jobs are ever the same. It's a job I've always found easy to do but I suppose that's because I was shown the right way and I've been doing it so long I can't remember when I started drenching them instead of dad (when I lived on the farm). 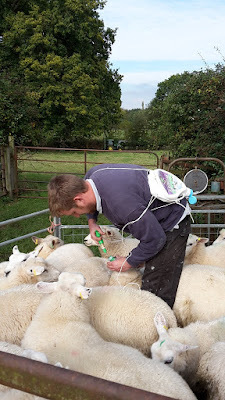 I simple try to get them where they can't run away (a tight pen for something like this is important otherwise you'll be chasing sheep all day), then I pull their heads back, push the nossel in their mouth and give them the drench. I mark each one as I do it so there are no repeat dosages. I try to keep the mark as small as possible as dad always hated to see sheep with lots of marks on them so I was nagged not to paint the sheep when I was younger! This is a job where I started out just being in the pen with dad when I was a child and when I was big enough I used to mark the ewes for him (which makes the job a lot faster), then as I became a larger teenager we used to interchange who did it. I have been reconsidering worming the entire flock after the barber pole worm episode this season. The initial worming as lambs and using the feed type blanket wormer seems to control all the other worms but the Barberpoles build up a quick resistance and then infect my pastures making the next generation immune. Been treating individually to counter the Barberpole infestations but the problem there is that some of the sheep are not showing any outward signs until it is too late. I read that there is a specific belt in New Zealand that has had to start treating the same way because of those damned worms. I'm glad we don't have them much over here - I bet you feel like giving up with them at times! Trouble with sheep is they try to hide any problems so they can achieve their life's ambition - to die! I suppose you have to dip them at some stage too. It was for these reasons that I was put-off keeping sheep myself. I don't dip, I spread a strike protection down their back and over their tails to protect them. I do this a couple of times a year depending on the weather. Good to get it all done in a day if you can, I have to do it in dribs and drabs when I can find an hour here or there. Always takes longer than you think! 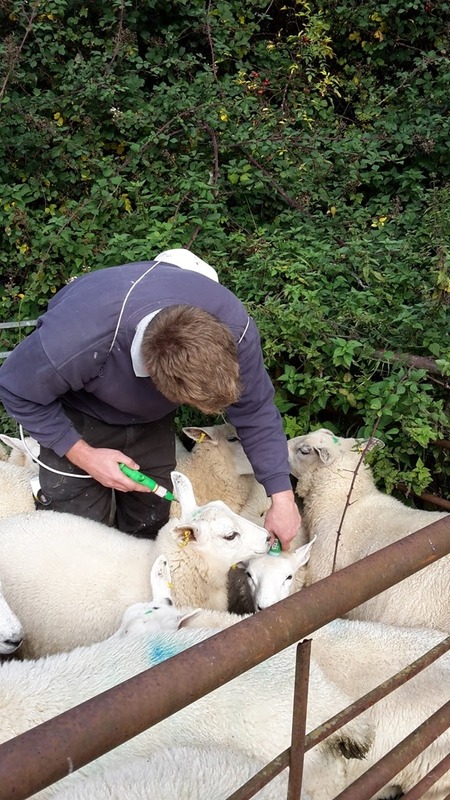 We dose the cattle with a dosing gun or by injection. Somebody told me that if I bought some wethers. They would get rid of the brambles is this so Kev? Only if they've got nothing else to eat! They have to have no grass before they start eating the rubbish in my experience. Goats would go for it straight away but your fencing has to be up to it! Wouldn't it be so much easier if you had Babe the pig to instruct them to come to you one by one for their wormer? hehe I loved that movie. I wish I had him here when I was trimming hooves. Baa Ram Ewe... I remember reading the book in school when I was young and trying it out but they don;t listen!